Any special day always makes us happy and some days are close to our hearts because most of us having memories with some special days. And like me all of you also have lots of good memories with this special day called “VALENTINE’S DAY”. The day to express love to your loved ones, for me every day is “Valentine’s Day “if your loved ones are with you. But still there is some special essence of the day which we can’t ignore. 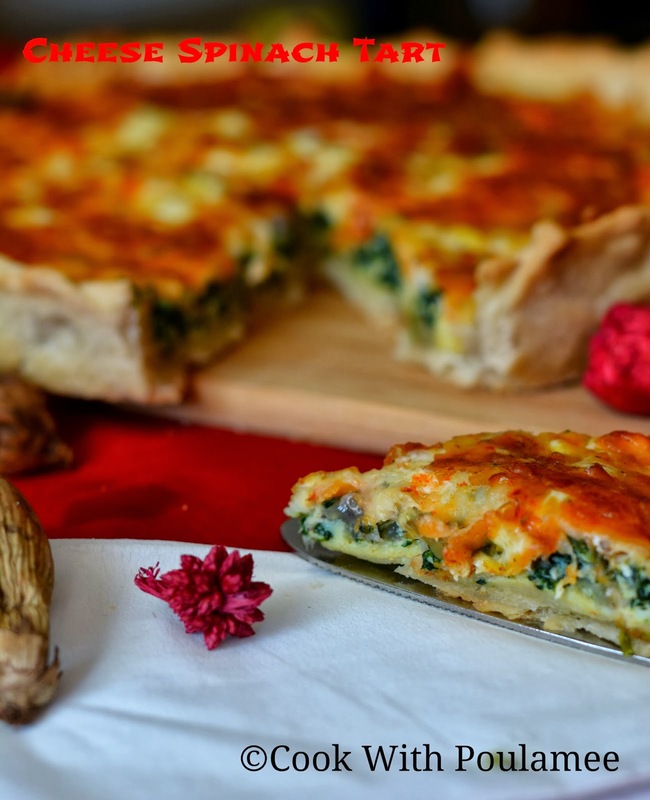 I wanted to surprise my husband with some special food which I never made before. 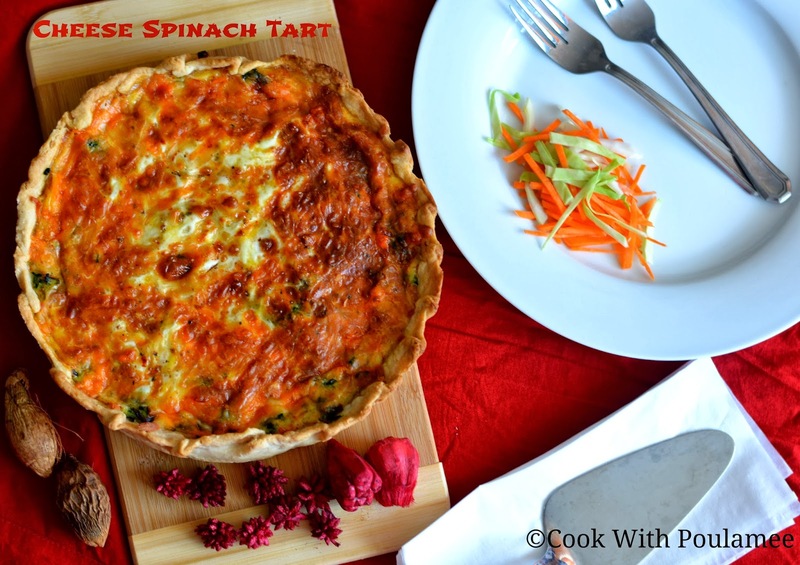 I was not sure before making it but I was actually surprised after tasted the SPINACH CHEESE TART MY V-DAY special food for my husband. Before trying any new baking dish I get so nervous but every time I become more and more confident or I can say it’s the best learning process. 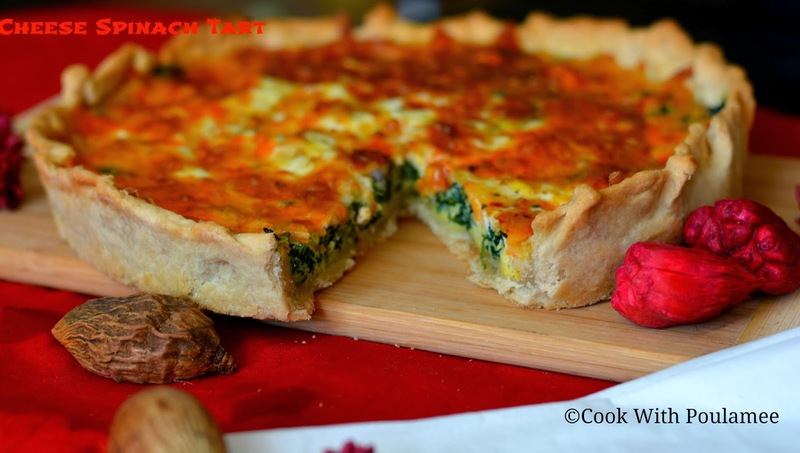 1.1 ½ cup all purpose flour. 1.Two fresh bunch of spinach. 2.One medium size chopped onion. 6.One cup cheddar and mozzarella cheese shredded. In a bowl add the flour, salt and sugar and mix well, now add the cold butter and mix well till the butter mixed completely. Now add the chilled water one table spoon at a time and slowly make dough don’t over mix it. Form the dough on to a round shape and wrap with a plastic wrap and keep thin refrigerator for 30 mints. Now pre heat the oven in 450F, now in a oven proof bowl roll the crust dough and crimp the edges just like my photo. Finely chopped the spinach, now add the chopped spinach into some boiling water with some salt just for 3 to 4 mints. Now drain the hot water and squeeze all the extra water from the spinach, you can use some tissue paper to completely dry the spinach. Now add some butter in a pan and saute the chopped onions till the onions are soft, now add the drained spinach and some salt and cook for few mints. Now in a separate bowl whisked the eggs, salt, cayenne pepper, nutmeg powder, cream and combine well. 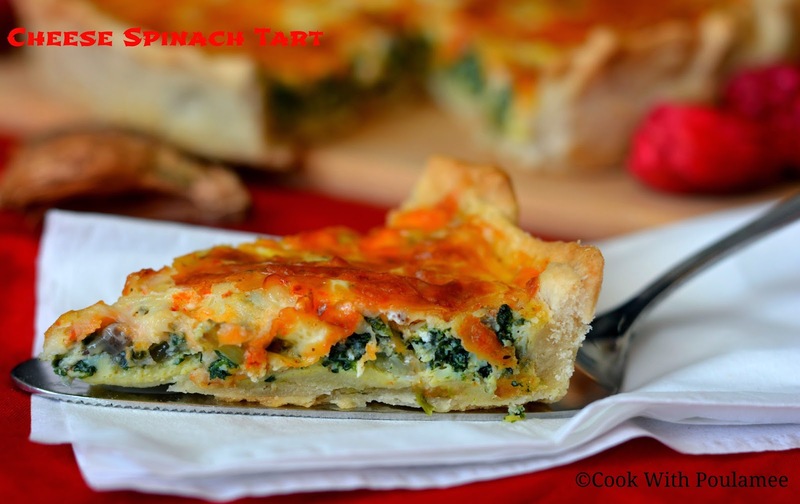 Now pour the fried spinach and onions on top of the pie crust, now sprinkle the cheese on top of the spinach and onions. Now pour the beaten egg mixture on top of everything. Now remove the tart from the oven and allow it to set up at least for 30 mints. 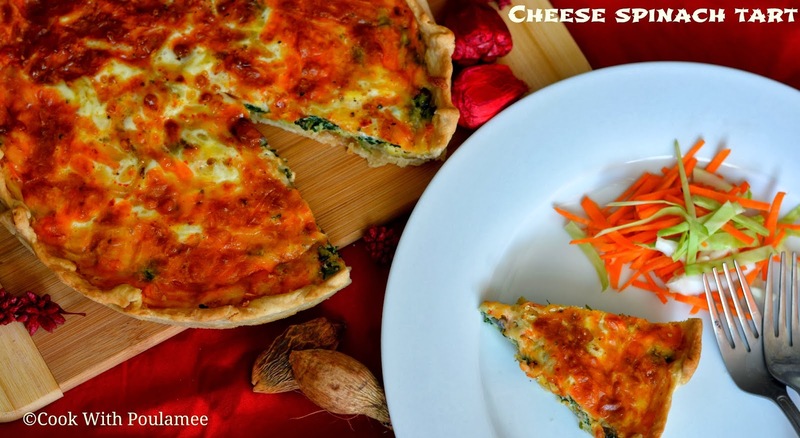 Now enjoy your SPINACH CHEESE TART with your loved ones.